New 12-month high wholesale electricity and natural gas prices were set in the Northeast and Midwest. Above average temperatures on January 20th led electricity demand to a 12-month low in California (CAISO). Total U.S. coal stockpiles are now at historically low levels due to coal plant retirements that have occurred over the past several years and also because of the seasonal draw-down of coal that usually takes place over the winter months. 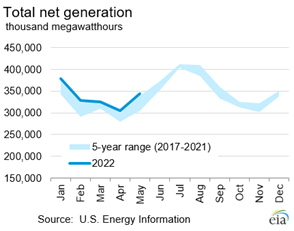 U.S. electricity generation achieved an all-time high in 2018, hitting 4,177,810 gigawatthours (GWh), a 3.6% increase compared with 2017 (4,034,268 GWh). The 2018 increase is the first significant increase in generation since 2010, when generation grew by 4.4%. Between 2010 (4,125,060 GWh) and 2017 (4,034,268 GWh), generation has ranged from flat to slightly declining. The previous U.S. all-time high for generation occurred in 2007 at 4,156,745 GWh. Note: Data for 2018 are preliminary. The increase in generation was driven by strong growth in electricity end-use sales. For example, total end-use sales were up 2.1% in 2018 compared with 2017, led by growth in the residential (6.2%) and commercial (1.8%) sectors. The increased sale of electricity in 2018 is attributable, in part, to colder winter and hotter summer weather in 2018 compared with the previous year. Weather was a major factor in electricity demand, particularly for the residential and commercial sectors, because heating degree days (HDD) were up 14% and cooling degree days (CDD) were up 9% in 2018 compared with 2017. Natural gas and non-hydro renewable sources (wind, solar, biomass, and geothermal) were the main contributors to the increase in 2018 generation. According to 2018 preliminary EIA data, natural gas-fired electric generation increased by 13.2% (from 1,296,415 GWh in 2017 to 1,468,013 GWh in 2018). Non-hydroelectric renewables increased by 9% (from 386,278 GWh in 2017 to 421,048 GWh in 2018). Nuclear power generation increased slightly by 0.3% (from 804,950 GWh in 2017 to 807,078 GWh in 2018). At the same time, coal-fired electric generation decreased by 4.9% (from 1,205,835 GWh in 2017 to 1,146,393 GWh in 2018). Conventional hydroelectric power decreased by 2.9% (from 300,333 GWh in 2017 to 291,724 GWh in 2018). These movements in generation are also reflected in changes in generation shares from 2017 to 2018. Natural gas increased its generation share from 32.1% to 35.1%, and non-hydro renewables increased its share from 9.6% to 10.1%. Fuels with declining shares include coal (decreasing from 29.9% to 27.4%), nuclear (decreasing from 20% to 19.3%), and conventional hydroelectric (decreasing from 7.4% to 7%). 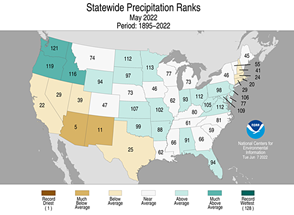 The changes in the 2018 generation mix are consistent with recent trends. 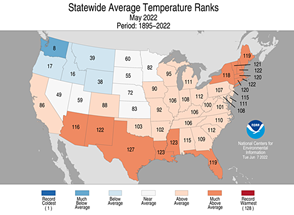 Several key trends can be seen in the past five years of data (2014–2018). Natural gas-fired and non-hydro renewable generation continues to grow, and coal-fired generation continues to decline. 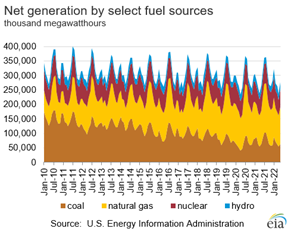 Between 2014 and 2018, coal and natural gas combined accounted for 64% of total U.S. electricity generation. However, the relative shares of output from these two fuels have shifted since 2016, with coal’s share declining from 38.6 % in 2014 to 27.4% in 2018. During the same period, natural gas’s share increased from 27.5 % to 35.1%. Natural gas units generated 1,126,609 gigawatthours (GWh) in 2014 and 1,468,013 GWh in 2018, which was an all-time high for natural gas generation and a 30% increase from the 2014 level. Coal units generated 1,581,710 GWh in 2014 and 1,146,393 GWh in 2018, a decrease of 28% compared with the 2014 level. Renewable energy sources include conventional hydroelectric power and non-hydroelectric sources (wind, geothermal, biomass, and solar). Hydroelectric power has traditionally been the dominant source of renewable power generation, accounting for 6.3% of U.S. electricity generation and 48% of all renewable generation in 2014. Non-hydro renewable sources provided 6.8% of U.S. electricity generation and 52% of all renewable generation in 2014. During the past five years, however, non-hydro renewables have continued to account for a larger share of renewable power generation, expanding to 59% of all renewable generation in 2018. Non-hydro generation has increased by 51% since 2014 (from 279,213 GWh in 2014 to 421,048 GWh in 2018). This growth was driven by increases in wind (growing by 51% to 274,952 GWh) and solar (growing by 276% to 66,604 GWh) since 2014.